If you are like most people, setting goals will be something easy for you. In fact, goal setting is easy; the difficult part is in achieving the goal. According to Scranton University, as high as 92% people who set their New Year resolution fail to achieve them. And that means only a small 8% people manage to achieve their goals and accomplish what they desire. In general, most people don’t know what they want in their life. Even if they do, they are not specific enough. When you ask them what they want, they will tell you answers like they want to be happy or they want to be rich. There is a small group of people who knows what they want, and they are very specific. They even write down their goals. And this action alone has dramatically increased their probability of reaching their goals. However, knowing what you want specifically and writing them down are still far from enough. You need to follow through your plan and take action each day until you reach your goals. This is why most people who set goals, fail to reach them because they are not doing anything about their goals. They give up and quit half way. They say they don’t have enough time; they don’t have the knowledge, etc. There are many reasons; you can check out it from this article, 21 Most Common Reasons Why People Fail To Achieve Their Goals. 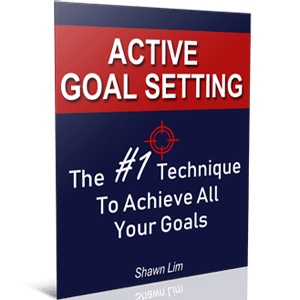 As for now, we are going to discover the secrets behind goal setting and how you can set empowering goals that will drive and motivate you to achieve what you want in life. So why do you need to have goals in life? Previously, I have written an article called Why Goal Setting Is Important, and I strongly suggest you read it. Anyway, here are 3 crucial reasons why you need to set goals. When you set goals, you give yourself a clear direction where you want to go in life. Most people live their life without knowing where to go. They are like lost sheep following the crowd. And when you know what you want to achieve in your life, you will fly like an arrow straight to the target. Your goals will act like the targets guiding you through life. Apart from that, having a goal in life gives you a sense of purpose. If you live life without purpose, feeling bored and not sure what to do, you probably lack an empowering goal. Professional athletes wake up early each morning, and they train hard to win the Olympics, what drives them? They have a clear and specific goal in their head. In other words, they have a purpose in life, and they are moving toward their goals each day. You have to do the same, set goals and go for them. Do you know why successful people are successful? It is because they have built their characters along their journey to achieving what they want in life. They learn, grow, and they improve along the way. On the other hand, unsuccessful people who don’t have a goal did not start on the journey. Thus, they didn’t go through the process of building their characters. And this is why they are not successful. There are many ways you can set goals. Some people suggest you follow the SMART goals principles, while some people suggest you set experience goals, etc. I believe that all methods work if you work on them. And here are 10 tips you can follow to set your goals. If this is the first time you are going through the goal setting process, it may take you awhile to do it. Hence, get ready and choose a quiet location where you can write down all your goals without distraction. Choose a place that is quiet or just lock yourself in your room. Get ready with all the writing materials. You can get some color pens and a notebook to do this. I prefer a notebook because I can refer to my goal whenever I want. You can do this in a coffee shop too, but make sure there are no distractions because you want to imagine and visualize your exciting future. By the way, you should get yourself a success journal to write down your targets, your dreams, insights and what you have learned. Once you are ready, and all your writing materials are in place, it is time to visualize the future and the perfect life you want. I first learned the “Blue Sky Thinking” technique from Brian Tracy. What you need to do is to imagine that everything is possible, and you have all the resources available to reach your goals and dreams. You want to project yourself into your future and imagine all the things that you want to be, do and have in life. Write down whatever that comes into your mind. You don’t have to be specific at this step because this is more like a brainstorming to find out your ideal life. Next, think about your vision and your long-term goals. You want to start with your long-term goals because they are the ones that will shape your life in the future. Long-term goals can be anything more than a year. A 3-year, 5-year, 10-year or 20-year goal is considered a long-term goal to me. Sometimes you may find it difficult to imagine that far. It is absolutely alright. You can start with your 3 years or 5 years goals. Most people have no problem to identify what they want in 3 or 5 years time. And you can always start from there. Write down what you want to achieve in the next 3 and 5 years. At this point, you want to be as specific as possible. After that, create your short-term goals. This is where you have to break down your long-term goals into short-terms goals that can be ranging from days, weeks and months. Short-term goals are important because they will determine what you do each day. Your long-term goals give you direction in life, while your short-term goals give you direction and tell you what to do every day. A 1-month, 2-month or 3-month goal is considered short-term. Personally, I like the one month and two months goals because they are short, and I can see the result faster. Write down your short-term goals and be even more specific this time. It makes your goals more tangible. Goals are like dreams, but when you write them down, you are giving them life and make them more real to you. It tells you that your goals are something important to you. Will you write down something that is not important? Not at all, when you put down your goals into writing, you are telling yourself that they are something important. It serves as a better reminder. Writing down your goals makes you remember them better. And this is very important because you want to program your goals into your subconscious mind. Review your goals daily. A lot of people thought that goal setting is a one-time work, where they just need to write down their goals once and forget about them. It is not. Goal setting is a continuous process where you need to review your goals until you reach them. Practice daily goal setting and look at your goals every day. Every morning before you start your work, write down your goals. You can write down all your goals or choose to write down your top 10 goals or whatever goals that you think are important to you. The key is to make it consistent because you want to bombard your goals into your subconscious mind constantly. This way, you will also activate the Law of Attraction and consciously turn your goals into your subconscious. The shorter your goals, the more specific they need to be. And don’t forget to include a time frame there. When you are specific with your goals, you will know what you should do to reach them. The time frame is there to help you and push you into action. You will know when you should reach your goals and able to measure your progress with a time frame. However, please remember that the time frame only serves as a signal to tell you what you should accomplish and by when. If you fail to reach your goals within the time frame you set, it is alright. It is alright to set outcome goals, but what truly gives us the result is our performance. In other words, it is our actions that matter. Thus, choose to focus on your performance. Try to set something different. Set performance goals rather than outcome goals. You are creating a schedule and building a habit of losing weight. If you follow through the performance goals you set, you will eventually get the outcome you want, which is to lose X pounds of fat. If you are a blogger like me, instead of setting your goal as to drive 1,000 unique visits or get 1,000 subscribers, set performance goals such as to publish 3 articles per week or to submit 3 guest articles per week, etc. Focus on the action and the performance, and you will get the results you want. We need to be balanced in our lives, so set goals in every area of your life. Make your life interesting and make it fun. Health – What time you want to sleep? Wake up? What is your ideal weight? What do you do to exercise and stay fit? Etc. Relationship – How much time you want to spend with your lover and family? What about your friends? What do you need to do to stay connected with your family each day? Spiritual – How can you connect to your higher self? Do you want to go to the church or temple? Do you want to learn meditation? Finance – How much money you want to earn, save and invest? How much networth do you want to have? Business and career – What business or career you want to develop? How can you do to serve more clients or create more value in your work? What goals do you want to achieve in business or your career? Personal development – What courses do you want to attend? How many books do you want to read? What other skills you want to learn? Fun and recreation – How many times do you want to travel in a year? Do you want to visit other countries? What activities do you like to do? Finally, the final step is to never give up. Whatever you do, if you fail to reach your goals within the time frame you set, don’t feel down or frustrated. Instead, find out why you fail and set a new goal or make the time frame longer. When it comes to achieving short-term goals, most people overestimate themselves, and they set something too high and to be achieved within too short a period. On the other hand, most people underestimate what they can achieve over the long-term. You have to keep learning and improving your skills, knowledge, and your strategies if you want to reach your goals. A quitter will never win, and a winner will never quit. So if you want to win and achieve your goals, don’t quit. Continue to march on. Find out what went wrong and what can you do to improve your plan. This is why you need to review your goals constantly. Now, we have talked about how to set goals and 10 tips that you can follow through. Let us go deeper into the topic on goal setting. Let me be honest with you, even if you follow the 10 tips above, there is a high chance that you are going to fail to reach your goals, why? This is because you don’t have the keys to unlock your potential. Here are the 7 keys you must adopt if you want to achieve your goals. One of the major reasons people fail to accomplish their goals is because they lack the consistency. Most people will take action in the beginning stage. They feel motivated, and they are so driven to take massive action. However, their motivation never last. They took massive action, but when they don’t see the results, they started to doubt themselves, and they lose confidence. They started to think negatively and get distracted. Eventually, they stop taking action, and then they get back to the starting point and look for other ‘better ways’ to do things. If you are serious about reaching your goals, you must develop the habit. You must take consistent action and develop it into a habit. Success will never come to you overnight. Don’t feel down or frustrated when you don’t see the results you want. The results will come as long as you take action, consistently, each day. Do understand that everything takes time, and the same goes for what you want to accomplish in life. The keyword is ‘without the loss of enthusiasm.’ You have to keep the momentum going and do the work regardless of whether you like it or not. Thus, be consistent and take action every day until you reach your goals. This is what most people never do. Whatever is out of your sight, will be out of your mind. This is why you need to review your goals constantly. Another great tool you can leverage on is to create a scoreboard for your goals. You can create a scoreboard that clearly shows you your goals, where you are, how much time you have and what you need to do to get there. Imagine when you are walking in the park. You see a bunch of kids playing basketball. You cannot hear them, but you can clearly see their moves. You can tell straight away if they are playing for fun or when they are keeping score. When people keep score, they will be serious with the game. Why do you think every sport involves scoring system? Imagine what will happen if two teams play without a score to tell who will win. Do you think the team will play seriously? Not at all. When the score is there, people can see it, and they want to win. Nobody loves to lose, and everyone wants to win. This why a scoreboard helps to boost your motivation, and it can tell you straight away, where you are and what you should do. Create a scoreboard to guide you to your goals today. Depending on your goals, you cannot achieve big success alone. You need help from others to make it. For example, if you want to lose some weight, you can leverage on a trainer to guide you and train you. It will be easier for you to commit and follow through because someone is there to show you the way. What’s more, the trainer will show you the proven methods to lose weight fast. If you do it alone, you may end up running on the treadmill or jogging in the park. You can lose weight this way, but it may not be the most effective strategy. This is why leverage is important. Don’t just do it on your own; it is difficult and no fun to do things alone. Do it with someone else and leverage on other people’s knowledge, skills, resources and time. Get someone to teach you how to do it. Find a mentor to guide you. This way, you can reach your goals faster, easier and more importantly, you will be more committed to what you want. If you are like most people, you will lose motivation, and you might give up somewhere along the line. Don’t! Find out what drives you. The only way to be consistent and to reach your ultimate goals is to keep the momentum going. You want to get motivated each day to work on your goals. And the only way to stay motivated each day is to find out what motivates you. So why do you want to achieve your goals? Your answers will determine your success. Extraordinary people have compelling reasons why they want to chase their goals. They are absolutely clear about their purpose. On the other, unsuccessful people don’t have a strong reason for their goals. Some don’t even know why they want to achieve it. This is why successful people can wake up early in the morning to work on their goals while unsuccessful people choose to sleep as much as they can. When you have a compelling reason, you will do whatever it takes, and the motivation will be strong. Think about it, if your life is at stake, would you do whatever it takes to save yourself from the situation? You would. Most people would do whatever it takes and not just doing what is convenient. Thus, find out what drives you. Find out your compelling reasons why you must make it. To learn more about this topic, read What Motivates You In Life. It is better to focus and working on only one goal at a time than to chase 10 goals all at the same time. If you chase two rabbits at the same time, you will end up catching none. Focus your energy on your most important goals. It is true that you should set goals in every area of your life, but when it comes to achieving them, you should identify the most important goal and work on it first. You have to prioritize your goals. For most people, usually, their most important goal is their financial goal. This is because when they reached their financial goal, they can make other goals a reality too. If you have only an hour a day to work on your goals, work on your MIG, your Most-Important-Goal. If you have more time, you should prioritize, and only then choose to work in other areas too. Remember, don’t spread your effort too thin. It is better to have one completed project than to have 5 uncompleted projects. Never underestimate the power of focus. When you put all your effort into only one area or one goal, you can accomplish amazing result there. A lot of people say that they want to be successful, but their actions prove otherwise. They say that they want to build an additional income from the internet, but when they got home after working, they choose to watch TV instead. So don’t just say it, but do it. Walk the talk and put in the commitment to achieve your goals. Don’t just set the goals if you are not committed to reaching them. Do something and work on your goals and make them come true. Share your goals with people who will support you. When you make a public commitment, you will be more committed because you are putting yourself on the line. Make a bet with someone you trust. For example, if your goal is to go jogging 3 days in a week for a month, put yourself on the line by saying to the person you trust that if you fail to reach your goal, you will eat a can of dog food. You want to give yourself no other options but to move forward and work on your goals. When you are committed, you will do whatever it takes to achieve what you want. Thus, burn the bridges and the boat. Leave yourself no other options. Cut off all other alternatives and make it the only way to survive is to work on your goals and achieve them. I learned this from the best-selling author Robin Sharma. He said that no matter what you do, make sure you take 5 action steps each day that will move you forward to your dreams and your goals. The steps can be as small as making a phone call or writing an article or sending an email. The key is to commit to doing just 5 things each day. And within a year, you will have completed 1825 small victories that will greatly impact and change your life. Imagine what would happen if you have accomplished 1825 steps related to your goals. You may or may not achieve your goal, but you will definitely move many steps closer toward what you want. Therefore, commit to doing the ‘Big 5’ each day. Take 5 actions that will lead you toward your goals. Remember, it is the action that will bring your goals and your dreams into reality. Without taking action or doing anything, it will be impossible to achieve what you want in life. Majority people fail to reach their goals because they are not doing anything about what they want. They set the goals, but they are not doing anything that will move them toward their goals. With the ‘Big 5’ method, you can now reach what you want in life, one step at a time. I hope you have a clearer understanding of goal setting and how you can make your goals a reality. So what do you think about this article? Do you that it has helped you and motivated you to move forward? Let me know what you think by leaving your comment below. By the way, if you like what you read, remember to share to enlighten others too.